Launceston boss Cliff Rainford say his side will keep getting better after securing their first win of the season. Lewis Paterson scored two tries while Kieron Lewitt scored one and kicked 10 points as the Cornish All Blacks won 30-19 at Dings Crusaders. "We're not the finished article, we've got room for improvement," Rainford told BBC Radio Cornwall. "We're going to move on from here and improve week on week. "We've come back after a great performance last Saturday, we asked them to make the next step and they did just that," he added. Paterson and Lewitt's tries came at either end of a first half that the Cornish All Blacks won 15-9. 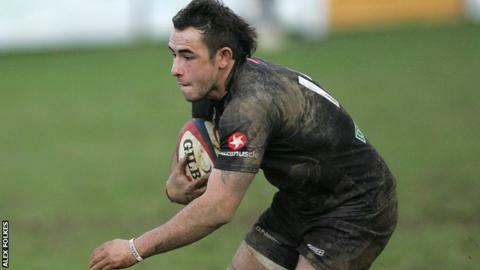 Paterson got his second after 55 minutes before Richard Bright scored Launceston's other try with 18 minutes to go. And Rainford says he is happy with how his squad is starting to come together. "The guys that have been here a few seasons now are started to gel with the newer guys and it's starting to come together. "It's a long road and it's a building process and we're quite a young side, but it's good to be where we are at the moment."